The Studentenchor is a choir for students and young people and welcomes everyone who feels like singing regularly and meeting nice people. 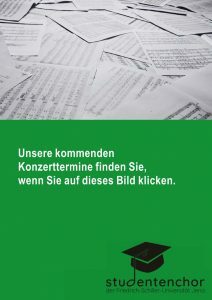 The choir is supported by the Friedrich-Schiller-University Jena, but managed and conducted entirely by students. Currently, our choir is directed by Fabian Pasewald. Regular rehearsals are during the semester time every Monday, 7 pm till 9:30 pm in room 104 at August-Bebel-Straße 4. Best time to join the choir is at the beginning of every semester during the first rehearsals or at the beginning of the year. The next chance to get to know us is on October 9th and 16th 2017. To avoid problems unskilled singers may have, they will be introduced to our voice trainer Tilman Wölz to be classified into the right parts (soprano, alto, tenor or bass voice). There is also the opportunity to take part in a voice training during the rehearsals. Chorusing does not only consist of music that is why the sweaty rehearsals are followed by a collective visit of the “Quergasse No.1” to slack thirst.